Cornelia Frances, actress from many Australian dramas, has died at the age of 77. English born and educated at a Catholic convent in Surrey, Frances’ earliest performances were limited to annual Nativity plays. From the convent she went to drama school in London and scored some minor movie roles. She then followed her boyfriend (later to be her husband) to Australia in 1965. 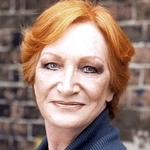 She worked as an announcer on Perth television and toured Western Australia with the National Theatre Company. She returned to England to get married and then came back to Australia in 1970. One of her first TV acting roles on her return was as fashion model Georgina Clausen in an episode of the ABC series Dynasty. She then reprised the role, renamed Cornelia Haysen, in the spin-off series Catwalk, made for the Seven Network. “She can be hard and bitchy, which I’m not. At least I don’t think I’m bitchy. But she is so similar to me in so many ways that I have had no trouble playing her,” Frances told TV Week of her character in 1972. Following guest roles in Boney, Ryan and Silent Number, Frances appeared in the film version of The Box. 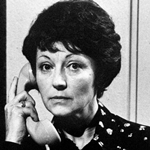 In 1975, she played a bitchy character in a Reg Grundy pilot The Two-Way Mirror for the Nine Network. 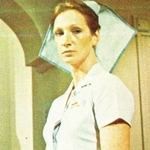 The pilot was not picked up for a series but the role led to her being cast by Grundy as the officious Sister Grace Scott in The Young Doctors. 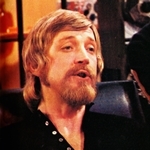 One of the show’s most famous cliff-hangers was when Sister Scott accidentally stepped into an open lift shaft after giving a stern lecture to one of the young nurses. 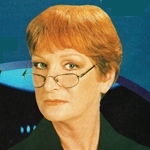 The character survived the accident with little more than a broken leg, but Frances was soon to leave the series after that storyline. She worked for Grundy’s again a few years later in Prisoner and Sons And Daughters (pictured with co-star Brian Blain) and then took on the recurring role of Morag Bellingham in the long-running Seven Network series Home And Away. 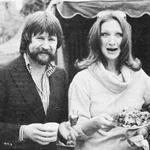 Other TV credits included The Lost Islands, Tickled Pink, All At Sea, Homicide, Division 4, Skyways, Cop Shop, Pizza and Always Greener and as a presenter for the magazine show Peter Couchman’s Melbourne (pictured with Derryn Hinch). Frances was diagnosed with bladder cancer in 2017 and appeared on A Current Affair in a special interview earlier this year. Cornelia Frances is survived by her son Lawrence Eastland. Source: ABC, IMDB, Sydney Morning Herald. 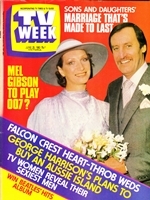 TV Week, 11 March 1972. TV Times, 5 February 1977.